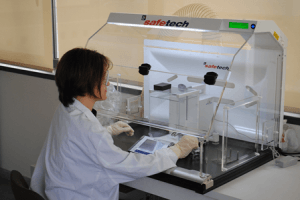 ST1 Balance enclosures / containment systems are specifically designed to protect the analyst from exposure when handling and weighing potent powders. The ST1 Balance enclosure system has a unique turbulent-free, low flow design which allows sensitive balances to operate without fluctuation and protects analysts from airborne contaminants. and user friendly in the industry. We offer contamination awareness and safe weighing workshops on site specifically designed for drug handling applications in the pharmaceutical laboratory. We can train up to 15 analysts in one day using a mixture of training presentations and hands on practical work. The safety enclosures of A1-Safetech are patented for the unique design which results in turbulence free circumstances.